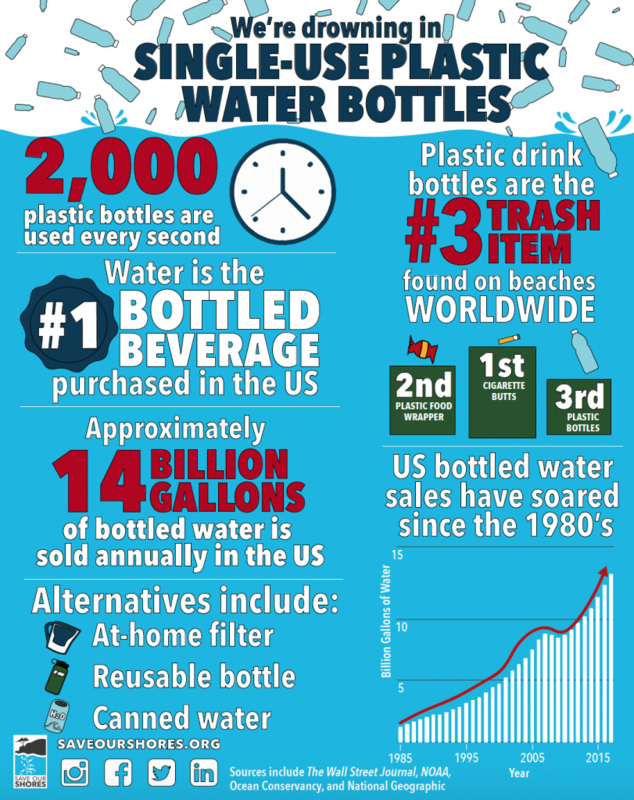 2,000 water bottles are consumed per second, and one million plastic water bottles are purchased per minute globally. These staggering numbers are a red flag for peoples’ addiction to the convenience of single-use plastic water bottles and that action must be taken to prevent the Monterey Bay from filling with this kind of pollution. We are working with local governing bodies to ban plastic water bottles throughout the Bay. Santa Cruz Board of Supervisors passed a comprehensive directive which requires the County of Santa Cruz Department of Public Works (DPW) to collaborate and develop recommendations designed to reduce plastic pollution across the County. Plastic water bottles were one of the items specifically called out. The action included a prohibition on the use of any County funds from being spent to purchase water in single-use plastic bottles for County meetings and events. This is just the beginning, and we will continue working with local government to reduce the impact of plastic water bottles!